Villa Le Zagare is a wonderful location where style and luxury are the frame of an unforgettable stay. Thanks to its strategical position, you can reach the main cultural sites in a very short time, making it ideal for leisure and business stays. Our professional and polite staff is always available to meet all your needs in order to make your stay as comfortable as possible. Villa Le Zagare is a charming hotel with stylish and luxurious interior for unforgettable stays. The pleasant and quiet environment of Villa Le Zagare will give you an immediate feeling of peacefulness making this an exclusive location with passionate care for detail. The unique style and warm colors make it a piece of art where customers and gastronomy become the main characters. Elegance and charm characterize the rooms of Villa Le Zagare. The typical ceramics of Vietri, marble and mosaic decorations, the careful choice of fresh fabrics and design objects coexist harmoniously, making it a perfect combination of classic and modern. All of this is completed by an amazing view that will surprise our guests. These bright and welcoming rooms, characterized by a classic and warm style, are located on the left side of the main building, overlooking the scented Mediterranean citrus garden. These spacious rooms are characterized by an exclusive style giving by the combination of classic and modern. Beauty and comfort make them always the perfect choice. These rooms are designed in order to provide a comfortable environment even for large families. Space, order and beauty characterize these rooms by recreating a warm and comfortable familiar environment. These rooms, romantic and equipped with every comfort, are located in an exclusive position where you can enjoy an enchanting view of the Gulf of Naples or the large garden surrounding the villa. The brightness of the environment, highlighted by our colorful ceramics, offer a nice feeling of wellbeing. 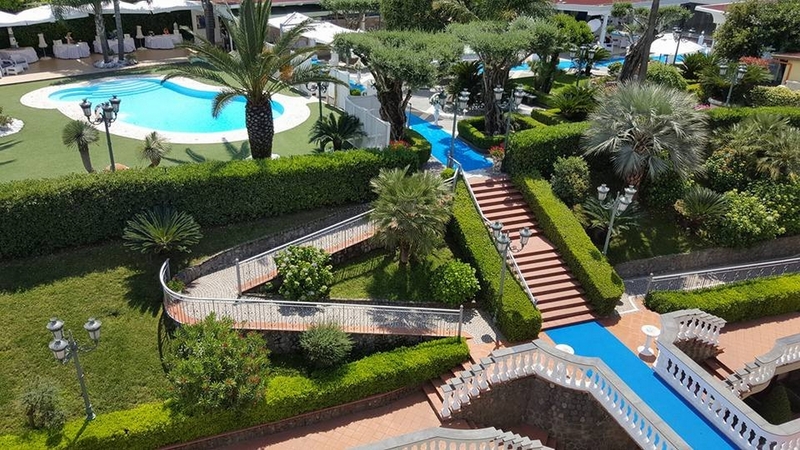 Staying at Villa Le Zagare means enjoying the relaxing ambiance of the location, and it gives as well the opportunity to see some of the most beautiful places in Campania. Thanks to its strategical position it allows you to reach the main cultural sites like the archaeological sites of Pompeii and Herculaneum, the enchanting landscapes of Naples, Positano, Ravello and the wonderful beaches of the islands of Capri and Ischia. The hotel staff, young and multilingual, will always assist you to arrange your daily visits to discover our cultural heritage or to organize guided tours in the Pasta factories of Gragnano, an experience you cannot miss. Upon request, you can make use of our Transfer Service from and to the hotel. We serve our buffet breakfast, made by a rich choice of hot and cold dishes and sweets, in the Capri Room, elegantly decorated with Vietri ceramics. The Lounge Bar offers a fine selection of aperitifs, cocktails, alcoholic and soft drinks prepared by our barman with snacks and tasty appetizers. It is also perfect to enjoy a glass of “Gragnano D.O.C.” wine, or a typical Neapolitan coffee or “Limoncello”. During your daily sunbathing you can enjoy a drink by the pool. Surrounded by a large garden with exotic plants and Mediterranean scents it’s the perfect place to take a rest. Villa Le Zagare is a multifunctional setting suitable for any type of event like Meetings or Business events. We are able to provide a range of different types of rooms according to your needs. Our Events Manager will follow you step by step assuring you our usual quality standard in order to satisfy all the requests for your meeting making it the perfect event. Thanks to the creativity of our chefs your conferences, meetings and seminars will match every type of food services: from coffee breaks to the most elegant business dinners. Villa Le Zagare Spa is the ideal place for people who want to escape from the daily stress, to restore their body and mind. A suggestive and relaxing place inspired from the concept “Salus per Aquam” of the Ancient Roman Termal Bath.